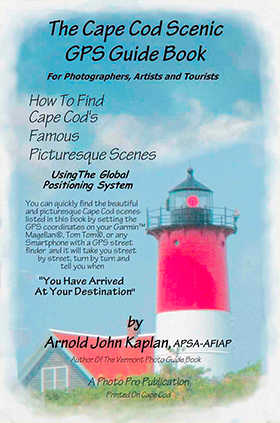 This is a new type of Cape Cod guide book for photographers, artists and tourists. It is a new idea and the first and only guide book of its kind at this time. If you have a GPS (Global Positioning System) unit for your car or smartphone for personal use, then you can use my book to locate and photograph, paint or visit 47 of the most picturesque scenes on Cape Cod. The scenes are shown on separate pages, each with a photo and description, plus the GPS Coordinates that you type in to your GPS unit or smartphone and they will take you, street by street, turn by turn , right to the photo scene or nearest area, then you will hear, “You Have Arrived At Your Destination.” No more following written direction, or asking direction, or reading maps. Saves time, mileage and gasoline. The guide book also covers the most popular beaches, golf courses, museums, playhouses, country stores, glass blowing, whale watching, and more that your GPS will find for you by inserting the street addresses listed. The book is pocket size, 5-1/2’ by 8-1/2” with a soft cover so that it will fit in your camera bag or pocket. It includes 72 pages, crammed with solid information about Cape Cod for the Photographer or Artists, also Tourist information for our visitors. The Cape Cod Guidebook is priced at $22.00, plus $2.50 U.S. postage first class. Click on the "Buy Now" button above to purchase it online. Otherwise, you can order via email and pay with PAYPAL using ID AJKGuidebooks@hotmail.com, or send a check to CLAIRE STERN at 3916 Sanna Wind Way, Langley, Whidbey Island, WA 98260. Be sure to include both your shipping address and email address with your order. Please contact us to order books or for further information.